On Wednesday, January 23, 2019, Circuit Court Judge J. Mark Rogers swore in the 2019 Officers for the Rutherford and Cannon County Bar Association (RCCBA). Judge Rogers swore in Murfreesboro Lawyer Scott Kimberly as RCCBA President. 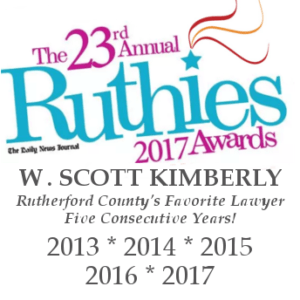 Scott is serving along with three other outstanding lawyers from the Murfreesboro area: Vice President Jennifer Potts; Secretary Catherine Mekis; and Treasurer Josh Jenkins. WGNS Radio published a Press Release from the RCCBA covering the event.